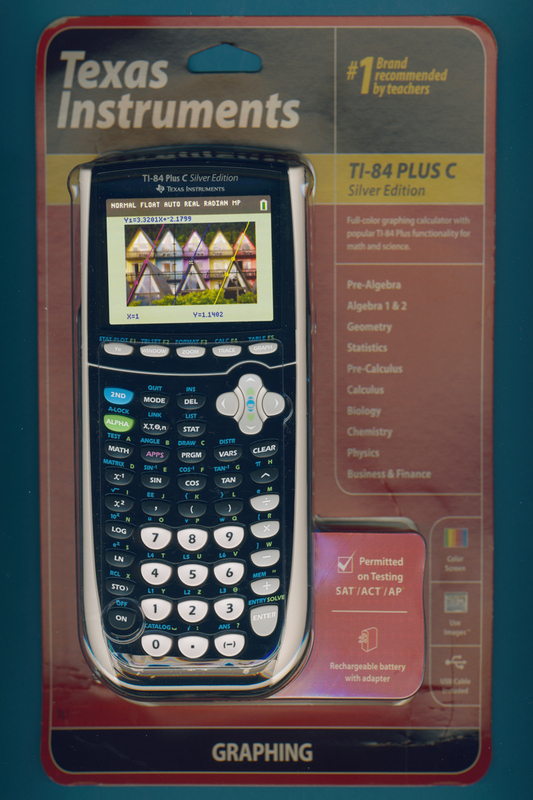 This colorful TI-84 Plus C Silver Edition was introduced for the Back-to-School 2013 campaign by Wal-Mart, the largest grocery retailer in the United States together with its blue sibling and the TI-30X IIS in matching colors of maroon, blue and gray. In 2013 Texas Instruments sold on its website faceplates in 15 different colors: Black, brown, dark red, red, pink, purple, dark blue, blue, light blue, green, gold, orange, bright orange, grey and white. Except bright orange were matching slide cases available, too. One special “Data Collection” snap-on faceplate highlights the keys and functions of the Vernier EasyData™ application. While the early members of the TI-84 Plus calculator family use AAA-sized alkaline batteries accommodates the Color verison an internal Li-ion battery with a capacity of 1,200 mAh and a voltage of 3.7 Volt for a typical operating time of 50 hours. A USB type wall charger is included with each unit but for classrooms is the TI-84 Plus C Charging Station available. It holds up to 10 calculators and charges them with two small contacts located in the front of the calculator. The TI-84 Plus Silver Edition supports the ViewScreen panel and the TI-Presenter with an Presentation Link Adapter. A serial port of the calculators allows the connection to the Calculator-Based Laboratory system CBL 2. The added USB interface of the TI-84 Plus family calculators connects directly with the Calculator-Based Ranger CBR 2 introduced in 2004. With a new cradle even the optional full-sized QWERTY Keyboard introduced in 2002 matches with the TI-84 Plus series.